If you've managed to keep the voracious Warriston pigeons off your crops you might have some kale left on your plot. It's a great winter staple and a 'superfood' to boot. It may not feel like salad season but this quick, easy and healthy dish goes well with baked potatoes and works surprisingly well alongside many comforting hot winter dishes. Serves 4-6. 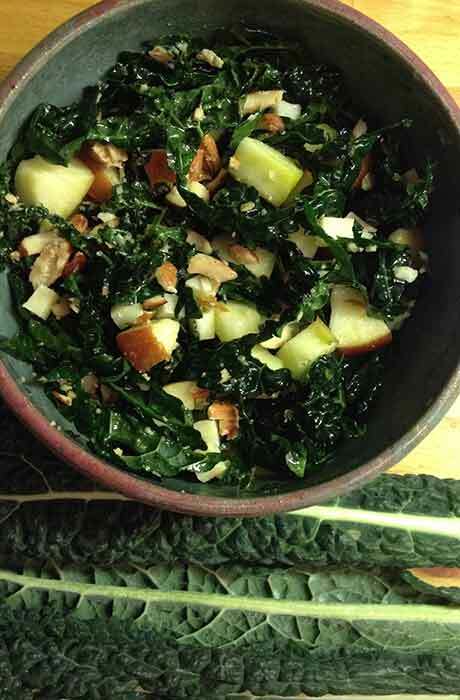 Combine the prepared fine slivers of kale, chopped almonds, diced apple and cheese in a large bowl. Whisk together the lemon juice, salt, garlic and olive oil. Add to the salad and toss well. Sprinkle the parmesan on top just before serving. Advance preparation: toss the salad in the dressing about 15 minutes before serving - the kale will soften in the dressing. Kale salad – quick, tasty and good for you.